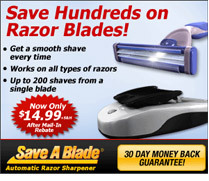 Summary: Save A Blade sharpens multi-blade cartridges and disposable razors in seconds. It uses a patented technology to sweep your blade at 3,000 revolutions per minute. Save A Blade incorporates a precision Silicone Carbide sharpening member that sharpens multi-blade cartridges and disposable razors in seconds. The secret is the patented Micro-Honing technology that sweeps across the blade at up to 3,000 revolutions per minute to sharpen and renew your blade in one simple step!